The CoffeeShop Blog: "Homemade REAL Soap in a Day!" Or, "Don't Fear the Lye!" 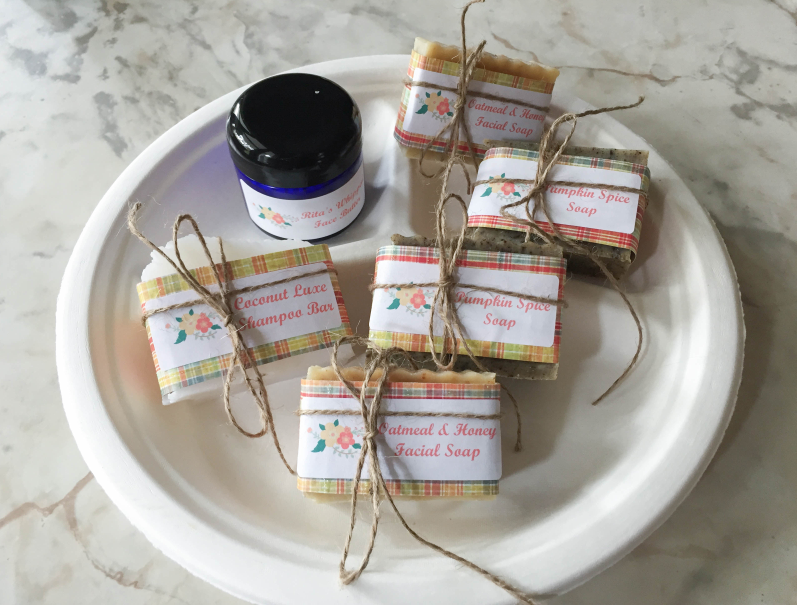 "Homemade REAL Soap in a Day!" Or, "Don't Fear the Lye!" 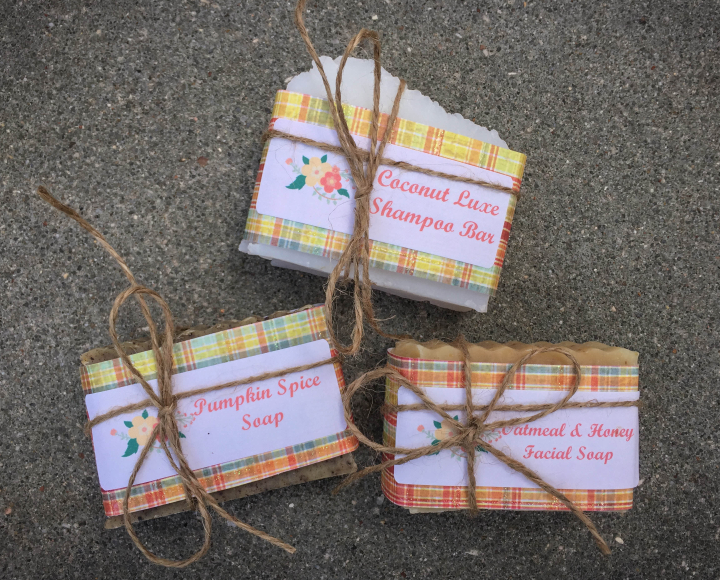 I wanted to get this post out before Christmas because homemade soaps make excellent gifts for friends and family. If I can make soap, anyone can make soap. And you can have a batch (8-12 bars) of gorgeous homemade soap in just one day using this method!!! 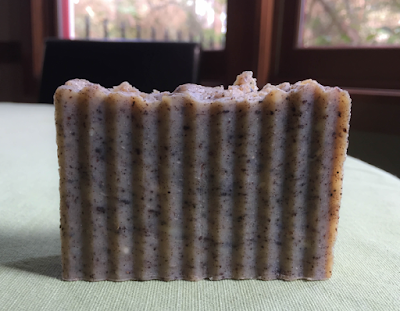 In this post I am going to talk about my experience making homemade soap (I just started this month) and I will link products I love and use in my own soap-making. I have made three batches so far and each one has worked perfectly and I have a few tips/tricks I want to share. I am not an expert at all so please read soap-making books and professional soap-making sites before trying it on your own! NOTE: I should be wearing long sleeves while mixing my soap, this is not safe! I also lost my safety goggles (the boys were using them as a slingshot) so I put on my sunglasses which is also a big no-no, always wear proper eye protection!!! CAUTION: I want to add that lye can be very dangerous (it is a powerful base that can burn you), so be sure to read up on it as much as you can before using it and wear safety goggles, safety long gloves, long sleeves and pants, and be VERY CAUTIOUS. Please do not let your children or pets in the area when you are handling the lye or lye water. I have wanted to make homemade soap for years. I was going to try the melt-and-pour, but most of them contain chemicals I really didn't want to use on my skin plus it seemed like soap-making cheating. So I bought these two books (Making Soup from Scratch and Smart Soap-Making) and read them cover to cover, exited to make real natural soap with lye. Unfortunately I was completely overwhelmed. Both books use a cold-process method to make soap and it really sounded complex and time-consuming. I was scared to use the lye (even though I have a genetics degree and spent many years working in labs handling very dangerous chemicals) and I knew that I couldn't wait 6-8 weeks to use my soap. I am an instant-gratification gal. 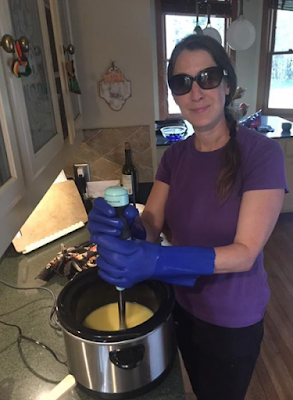 However, the soap-making bug hit me again this month, so I googled "making homemade soap with lye" and discovered this amazing post/video on making hot-process crockpot soap. Crockpot soap can be used the same day you make it!!! It is not as smooth and pretty as cold-process soap, but I actually prefer the "rustic" look of the hot process. Some of the soaps still need some aging time to make them really hard, but they are safe to use right away. I was sold and decided I was going to do it. 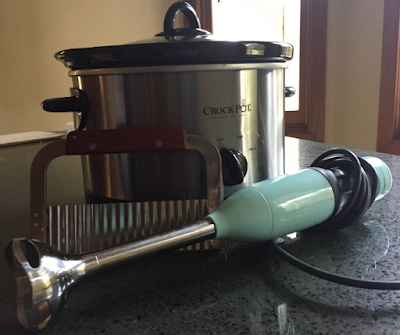 I have an old crockpot (I just use it for crafts and not food since I purchased my instant pot) and a really nice stick mixer. I originally used a normal knife to cut my soap but decided to invest in this crinkle cutter which adds so much to the finished product. You also need a decent kitchen scale like this one. Many people have dedicated soap-making containers and spoons for fear of contamination. I wash everything in vinegar water, then soapy water, and rinse with lots of water and run everything but the crockpot in the dishwasher. I don't personally worry about using them later with food, but only do what makes you feel comfortable. Better safe than sorry! 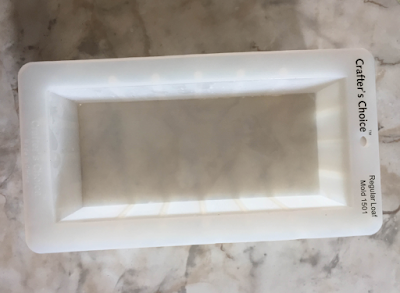 I originally used a regular glass loaf pan lined in parchment paper for the mold, but realized that was a pain in the rear and my soaps weren't as pretty, so I bought this perfect silicon soap mold that is worth every penny. This is another great basic soap-making tutorial, but I don't do the zap test to test for lye, I always cook for one hour at low and then test with pH paper. So far I have only used recipes I have found online, but after three batches I am confident I can make up my own recipes using this lye calculator. It never hurts to run any recipe you find through the lye calculator to make sure it will work. This lye calculate also allows you to resize batches for your own containers. My silicon mold can hold 28 ounces of oils plus the lye/water combo (I figured this out by measuring it and using this formula), so I can fill it exactly to the top after running the numbers. And the calculator also tells you the final hardness, conditioning, foaming, etc of any oil combo soap. I am a huge nerd and once I figure out how to use it I can't stop playing with it! 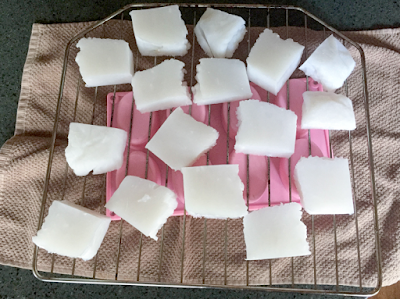 This was my first batch of Coconut Shampoo bars. I cooked them one hour on low in my old crockpot, did the zap test and went through my freak-out (mentioned above), mixed in 20 drops of rosemary and lavender essential oils (not enough, I can barely smell it) and they turned out great. This is the perfect starter soap recipe since you only use one oil (I buy huge jugs of coconut oil at Costco) and lye and water. They hardened in just an hour or so and I was able to cut them and start using one that day. These bars foam like crazy and are perfect for washing hair. I was paying $5-$6 for shampoo bars online and I made 16 of them for less then $10. I sometimes follow up with a vinegar wash and my long hair is soft and shiny. My husband uses these for his hair and body and LOVES them! 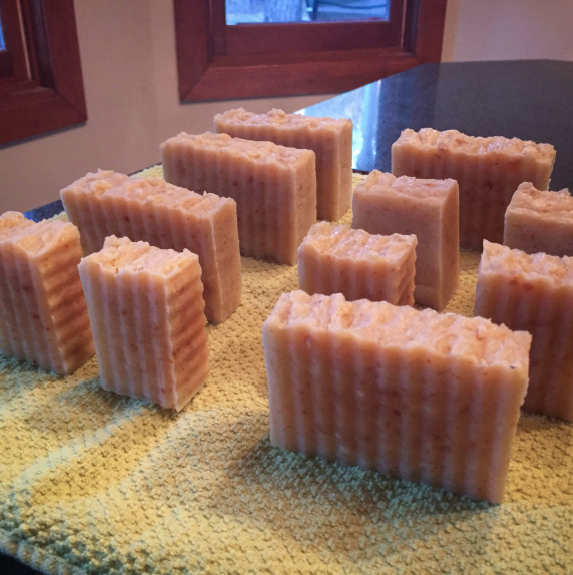 Here is my second batch of homemade Oatmeal and Honey soap. I cooked this one for an hour after it came to a thick trace, and Duke checked the pH and it was around 8-9 (perfect!). These bars smell lovely but they are softer due to the olive oil concentration so I am aging them a few weeks so they won't quickly melt away in the shower. I wasn't going to do any crazy colors or scents originally, but now I am addicted and wanted to make a "fancy" soap. My third soap was this Pumpkin Spice recipe that ROCKS! I didn't add the essential oils but otherwise followed the instructions exactly and the soap smells like fresh baked pumpkin bread. Seriously, the boys and I wanted to eat it! It was ready to come out of the mold and be cut in about 4 hours and we used it the same night. It is very foamy, conditioning, and made our hands smell heavenly. This one was a real winner! I really love the speckled brown color of this soap. After all my soaps were dried I cut them in half and wrapped them in fancy paper, added some labels, and tied them with kraft ribbons. These are going to my sister Heather today. I hope she loves them as much as I do! If you have never made soap this huge post will probably drive you bonkers, but once you make a batch you will see that it is so darn easy. And if you stick to simple oils like olive and coconut it is very affordable. OK, here are some tips/tricks that might help you get started. 2. Light trace looks like a soft pudding. I usually go to hard trace which reminds me of a thick pudding/whipped cream. I have read you don't have to be too worried about this step, the oil/lye/water will become soap as long as it is mixed together and incubates (even at room temperature). It is not rocket science! 3. To clean your crockpot and spoon, scrape off all of the excess soap, roll it in a bar, and use it! Then soak everything in warm water. The soap will just melt off in an hour or so. 4. Once you make a few simple soaps, use this lye calculator to design your own. The sky is the limit with oils and flavorings. I would love to hear your own soap-making adventures in my comments. You are a braver woman than I am. Good luck with your soap making venture. If I lived closer to you and you had one with ingredients I wasn't allergic to, I'd buy from you! A lot of people are wanting something a bit more natural these days, I know I do. I wish you did live close then I would bring some over to you! I am sure I could make one that wouldn't make you allergic. I can't wait to see your results Angie! Please post them on my Facebook page!! !